Tucked away in a mountain on the edge of nowhere in Abruzzo is a hermitage that was built into the mountainside. San Bartolomeo is famous in the Catholic Church as a miracle worker protecting and curing convulsions, headaches, paralysis and mental health problems. He’s normally depicted with a knife as, according to who you believe, he was flayed and crucified upside down in Armenia where he’d gone to preach from Syria; others say he was beheaded, perhaps that’s why he’s the patron saint of butchers and tanners. 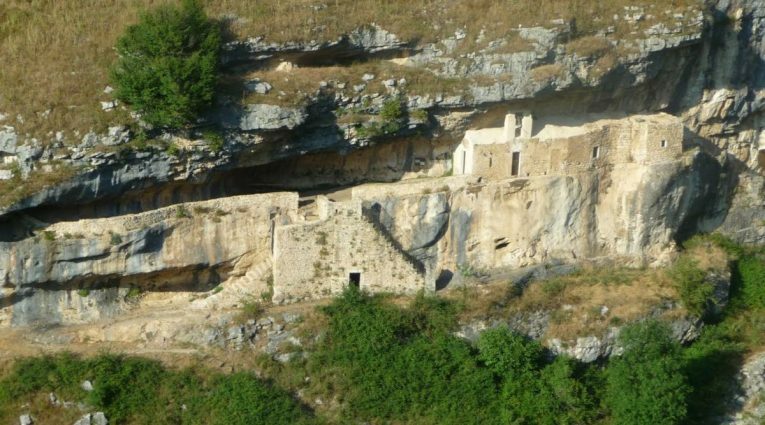 The Hermitage of San Bartolomeo in Legio in Roccamorice is one of the most famous hermitages in all of Italy, and a place that still preserves its aura of spirituality and peace. The destination of a great number of pilgrimages, it can be reached only on foot, and the path is alluring for lovers of the mountains. Located on a rocky spur of 50 meters in the municipality of Roccamorice, its building undoubtedly dates back to before the 11th century and it was restored by Pietro dal Morrone, who was going to be Pope Celestine V, around the year 1250; he stayed there starting 1274. Dug into the rock, the hermitage includes a chapel and two buildings for the monks. It can be accessed from four different staircases, one of which is known as the “Scala Santa” (Holy Staircase). On the facade of the church some traces of frescoes can still be seen, gravely damaged by the weather. August 25 is the key day for worship, the Saint Day of San Bartolomeo: the pilgrims, after going to Mass at dawn, plunge into the waters of torrent Capo la Vena and go on a procession with the Saint’s statue up to Roccamorice, where it will stay for two weeks. This sight is a can’t miss when visiting Abruzzo and it brings a memory that will last forever.